Zollinger - Ellison Syndrome may occur due to gastrinoma or pancreatic islet tumor. Patient typically present with perforated ulcer, peptic ulcer disease, steatorrhea, diarrhea and loss of weight. Gastrinoma is associated with multiple endocrine neoplasia type 1. Patient with gastrinoma may need to be treated with surgical removal of the gastrinoma. Gastrinoma may need to be removed as it may secrete gastrin which lead to hypersecretion of the acids which may lead to inactivation of the pancreatic enzyme and peptic ulcer and decreased in the pH of the stomach. 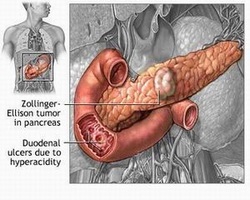 Gastrinoma is usually arise in the duodenum and the pancreas which are malignants and able to metastasis to the liver.